"it’s a mistake to think we can glide through modern life unaffected by others’ struggles with literacy. Consider the manufacturing employee who can’t read warnings on labels, mixing the wrong chemicals and releasing a gas that injures co-workers or home health aides earning minimum wage who can’t follow directions on medication packages or equipment. Too many legislators and citizens don’t read bills before the votes are cast. And then there was the subprime mortgage debacle, with thousands of home buyers trusting loan officers on unrealistic and unaffordable terms, signing toxic contracts that eventually threatened the global economy.... Reading and writing, early steps to seducing the hearts and minds of others through the arts, are tools of power, suggests Robert Greene in The 48 Laws of Power ... Those who belittle education and reading would deny others power." Photo: US Army Sgt. 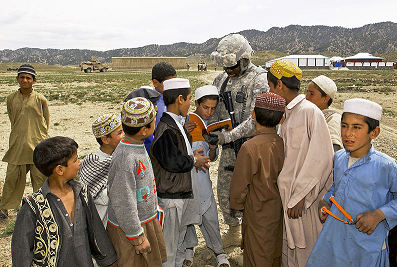 Terrance Ray of the Paktika Provincial Reconstruction Team reads a book to children in Orgun, Afghanistan; courtesy of Wikimedia Commons and US Army.